"For all I know I'm probably at one. My body, that is. It goes to a lot of parties without me. Says I only get in the way." Is anyone else bothered by the fact that they might not exist? I used to suffer from blackouts when overindulging in alcohol. Thankfully this hasn't happened to me for quite a while and I'm hoping to keep it that way - it's always massively disquieting. The odd thing about these episodes though was that when I next saw the friends with whom I'd spent this lost time they more often than not say how much fun I was being, how witty I was and how it was good to see me relaxing and letting myself go once in a while. (Occasionally they'd say I just started slurring, stumbling and then fell asleep in a corner, but let's not go into that). But what I want to know is who was in control during these times? Who made the jokes, who relaxed and let himself go? Not me, that's for sure. I'd have remembered that. That is, unsurprisingly, the key to the matter. Memory. I suspect we only have a sense of self, of consciousness when both long and short term memories are intact. Perhaps during these blackouts the long term memory stops being recorded (someone pressed the pause button by accident) with the result that the machine carries on as normal but without me actually being present in the normal sense of the word. I find rather worrying that my body can have a great night out and be the life and soul of the party without me. During the above description, I've been using terms implying that someone else can be "in control", that "I" can be absent. This is a linguistic throwback to dualism - imagining that the mind and the body are separate entities, a theory generally frowned upon from a great height these days. Modern thinking implies that we are our bodies and nothing more, that consciousness, the sense of self, is an illusion caused by the way the brain works. There is no Cartesian Theatre (a term coined by philospher Daniel Dennett in his book Consciousness Explained a book which I will have to attempt to read again in order to get it straight in my head) where you sit inside your brain watching and listening to the news reports from your sensory organs and making decisions accordingly. 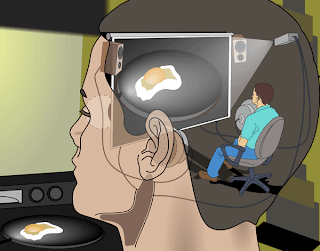 This kind of makes sense - if human consciousness is explained by a homunculus sitting in the Cartesian Living Room with his Cartesian Remote, then how do we explain the homunculus's consciousness? It's just moving the problem, in the same way that saying god created the universe moves the problem of creation one step further away (i.e. so who made god?). Perhaps these problems don't exist. There's no god, there's no human mind. In that case, who's writing this? What makes me me? Am I the sum of my memories in a very literal sense - take away the long term memory and I'm no longer conscious? I don't exist? Cogito Ergo Non Sum. I think this biological mechanism is going to have to do a bit of reading.